Thanks for visiting my new website! For all my blog posts prior to September 2016, please visit my old website. Not all bad: one of the highlights of the camp was this hike with our Swiss and Finnish friends. We spent the first two weeks of the camp in a little Bavarian town called Siegsdorf, which is only about 20 minutes from the World Cup biathlon stadium in Ruhpolding. We did a lot of roller-skiing, shooting, and hiking. For some of our workouts we were joined by the Swiss national team, the Austrian women’s national team, Finnish biathlete and 2-time World Cup Overall champion Kaisa Makarainen, Megan Tandy from Canada, and Amanda Lightfoot from England. For the third and final week of the camp we relocated to Oberhof, in eastern Germany, where there is another World Cup stadium as well as an indoor, refrigerated ski hall. (Last summer we went to a different indoor skiing facility in Torsby, Sweden, which I wrote about here.) Unlike the tunnel in Torsby, the Oberhof Ski Hall is built above ground. From the outside it sort of looks like a mall, whereas the Torsby tunnel looked like a giant mole-hole. Inside, they both look and feel the same- about 22 degrees Fahrenheit. 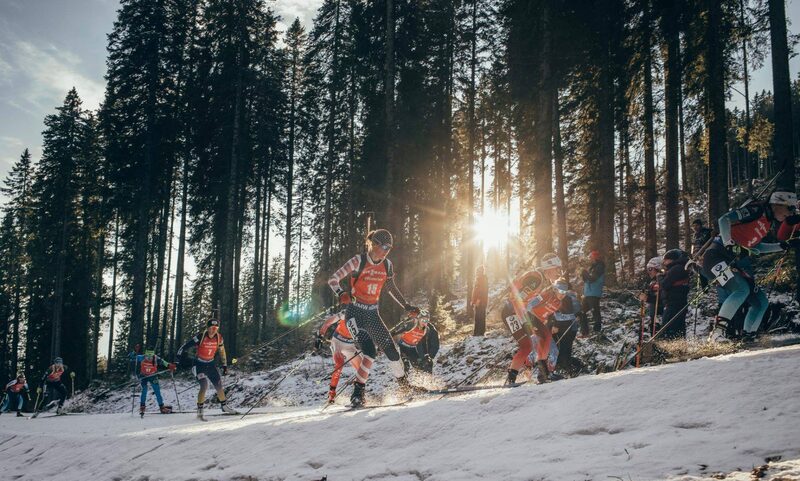 This weekend we finish off our camp by racing in German roller-ski national championships. The spectators are already starting to arrive! Saturday is a 3-person relay and Sunday is a mass start. Since Maddie is sick, Susan and I will be racing in the relay with our Canadian friend, Megan Tandy. On Monday I will travel home to my apartment in Lake Placid where Erik, his best friend from college, and my parents will all be waiting for me! I can’t wait. Good thing I have Susan and Maddie to prop me up after three weeks of training camp. Here we are modeling our new Adidas ZNE hoodies. Clare, love your new websight! We are so lucky to have had the chance to have a ringside seat to watch your great journey from riding your unicycle on our driveway to your debut as Peter Pan, to where you are today is nothing short of incredible ! Funny also that we lived for a while in LP at the old training center. We wish you the best always and for the approaching season! PS Also in the picture of you sporting the ZNE hoodies what kind of cool sandals are you wearing? Next PostNext Last Month Was Awful!